Disclosure: I received passes to attend an advance screening of FROZEN. All opinions expressed are my own. Before we had kids (back when I had hobbies and some measure of time for them), Andrew and I saw movies all the time. We don't have that luxury anymore, so any chance to see a new film is exciting. And there's no way I would want to miss a new Disney princess movie! 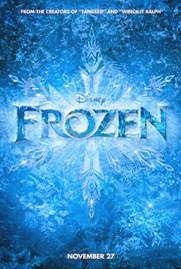 FROZEN, out in theaters today, is the latest offering from Walt Disney Animation Studios (creators of Tangled and Wreck-It Ralph). The voice talent includes Idina Menzel, Kristen Bell, Jonathan Groff, and Josh Gad. Loosely inspired by the story of The Snow Queen (by Hans Christian Andersen), this story follows sisters Elsa and Anna from childhood until a very pivotal event in their lives - when Elsa is crowned Queen of their kingdom of Arendelle. After Elsa's icy power traps Arendelle in an eternal winter, Anna sets off to make things right. Her journey introduces her to a talking snowman, some "love experts," and a very adorable reindeer named Sven. I went into this movie expecting it to be an icy version of Tangled. The trailers did not overly impress me, so I guess my expectations just weren't very high. I am happy to say I was pleasantly surprised. I was distracted during the first scene of the movie because the 3D element was not working properly in our advanced screening auditorium. Once that was resolved, I was quickly drawn into the story. I found the characters of Anna, Elsa, and Kristoff as children to be unbelievably endearing. Maybe that's because they said things that made me laugh, or because tiny Kristoff looks an awful lot like my son Lincoln - but regardless, for only being in the first bit of the movie, they all left an impression. The song little Anna sings to her sister Elsa has been running through my head for more than an entire day. The movie had a nice pace throughout, not too slow, but not too fast. The characters were all likeable and well-designed. I found myself smiling and laughing like all of the young kids around me. I found Idina Menzel (best known for her portrayal of Elphaba in "Wicked: The Music") an odd casting for Elsa at first - during her first musical number, her character just seemed too small and innocent for that powerful voice. Once Elsa had "transformed," it was a better fit. I did wish for a better "showcase" song for Idina's voice, however! I was also surprised that Kristoff (Jonathan Groff) did not have a song aside from a small comic melody. A few of the songs felt a little unnecessary and as though they were written for the stage, not screen - but they were still enjoyable. I think my biggest contention with this film is that there is no true standing anthem song - or love song. Overall, I don't think it quite ranks as a Disney classic in the same sense as Cinderella or Snow White, but it is fun, heartwarming (pun intended), and sweet. I'm putting it on my wish list of titles to own for our kids' collection. FROZEN is rated PG for mild action and rude humor and has a running time of 108 minutes. Have you seen it? What did you think? Nice review! I'm thinking of taking my 4-year-old tomorrow, but 108 minutes might be a bit long for her attention span! I wanted to take my almost 3-year-old, but I knew he wouldn't last! My friend' little girl, who is also almost 3, loved it and sat still as a mouse though!